The BRICS High Representatives met Indian Prime Minister Narendra Modi to brief him about their talks and recommendations. As their High Representatives met to strengthen intra-BRICS cooperation against terrorism, the five nation group decided to exchange best practices, expertise, information and knowledge on counter-terrorism issues. Russia mooted the idea of setting up a joint BRICS database containing details of all foreign terrorists operating in their regions. A crucial gathering of National Security Advisors from the five nations met for the final meeting of the BRICS annual calendar, ahead of the Summit less than a month away. 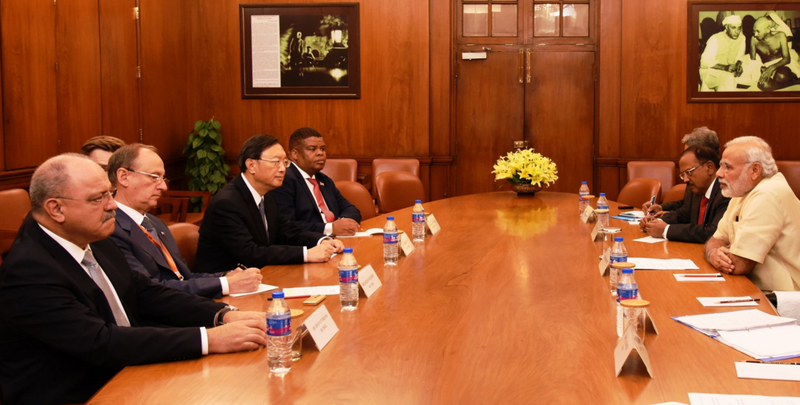 The BRICS High Representatives responsible for security held their sixth meeting in New Delhi on Thursday, September 15, to review the status of security in their respective countries and discuss how to strengthen security cooperation among their countries. The High Representatives on security met a day after the BRICS Joint Working Group (JWG) on Counter-Terrorism meeting on September 14. India, the current chair of BRICS (Brazil, Russia, India, China and South Africa) hosted the first ever meeting of the JWG on counter-terrorism at a time when it has raised international pressure on Pakistan, which it claims is the principal sponsor of terrorism in the South Asia region. Delegations from all BRICS nations attended the meeting. The idea for the JWG had been finalised at the Ufa summit of BRICS in 2015, during the Russian presidency. Santosh Jha, a senior official in the Indian Ministry of External Affairs, chaired the meeting. The Brazilian delegation was led by Nelson Antonio Tabajara de Oliveira, the Russian delegation by Ilya Rogachev, the Chinese by Liu Guangyuan, and the South African delegation was headed by Nakampe Michael. That meeting discussed various issues related to terrorism including domestic perspectives and assessments of threat scenario and cooperation among BRICS Member States on capacity building, information sharing, technology sharing, countering online radicalisation as well as cooperation in multilateral forums such as United Nations and Financial Action Task Force. Providing their inputs to the High Representatives, the JWG on Counter-Terrorism expressed concern over terrorism emanating from the West and South Asian region, and discussed how best all the BRICS countries can collaborate, can pool their information, resources or counter intelligence efforts. Ajit Doval, India’s National Security Adviser, chaired the meeting of BRICS High Representatives, at which Nikolai P. Patrushev, Secretary of the Russian Security Council, mooted the idea of a joint database with details of all the foreign terrorists and radicals operating worldwide. This would help monitor their movements and help keep track of these terrorists. Saying that international terrorism remains a major threat to BRICS, Patrushev said, "It is important to strengthen cooperation to prevent and combat the activities of foreign terrorists, both in the areas of armed conflict, and after their return to their homeland. It is necessary to intensify the exchange of information regarding terrorist movements and their participation in the radicalization of political and social sentiment in our countries," the National Security Council press service quoted Patrushev as saying at the meeting. Other than Doval and Patrushev, others who attended the closed-door deliberations of the National Security Advisors were General Sergio Westphalen Etchegoyen, Brazil’s Minister of State and Head of the Cabinet for Institutional Security of the Presidency, Yang Jiechi, Chinese State Councillor and NSA and Mbangiseni David Mahlobo, South African Minister of State Security. Doval gave a detailed presentation on the security situation in the South Asian region, particularly the terrorist activity emanating from India’s neighbourhood (Pakistan). He provided some inputs about discussions held with the Afghan President Ashraf Ghani, who was visiting New Delhi at the time, and gave a detailed assessment of the situation in Jammu and Kashmir, sources told RIR. The High Representatives deliberated on security issues such as Counter Terrorism, Cyber Security and Energy Security. They also exchanged assessments of recent developments in the West Asia and North Africa (WANA) region, a statement from the Indian foreign ministry said. “The High Representatives encouraged cooperation and exchanging of best practices, expertise, information and knowledge on Counter Terrorism issues,” the statement said. “They also agreed to expand BRICS Counter Terrorism cooperation further to include measures for denying terrorists access to finance and terror-hardware such as equipment, arms and ammunition,” as they sought to build stronger security linkages between BRICS. After their meeting, the BRICS High Representatives met Indian Prime Minister Narendra Modi to brief him about their talks and recommendations, the important ones of which will find mention in the Summit Declaration, a senior official told RIR. Modi tweeted that he had a “very good meeting” with the NSAs of BRICS. Vikas Swarup, India’s foreign ministry spokesman said, “We all know when we talk about the WANA region, ISIS is the prime perpetrator of terrorism from that region. The idea is how we can counter that threat and more importantly the de-radicalization process to ensure that we have in place the appropriate structures so that those terrorist attacks do not start impacting our region,” Swarup said, giving details about the discussions. The annual BRICS summit is being hosted by India this year, in Goa on October 15-16. This will bring together BRICS heads of state for the summit, the theme for which is, “Building Responsive, Inclusive and Collective Solutions,” also a play on the letters making up the BRICS membership. As the host, India has exercised its privilege to arrange a regional outreach, and invite leaders of some neighbouring countries to attend. The BRICS summit at Fortaleza in Brazil in 2014 saw an outreach gathering of several South American nations. The BRICS summit in Ufa in 2015 coincided with the summit of the Shanghai Cooperation Organisation, which saw all the leaders of the Central Asian Republics and Iran, Afghanistan and Pakistan also attending. In Goa this year, India has chosen to host the leaders of the seven-member BIMSTEC (Bay of Bengal Initiative for Multi-Sectoral Technical and Economic Cooperation) group. The BIMSTEC is a potential Bay of Bengal Economic Community comprising Bhutan, Bangladesh, India, Nepal and Sri Lanka from South Asia and Myanmar and Thailand from ASEAN. Unlike SAARC, this group does not include either Pakistan or Afghanistan. The Afghan President just visited New Delhi for high level talks. India clearly is sending a signal that it does not want Pakistan at the Goa deliberations, because it views Islamabad as the principal sponsor of terrorism in this region.